My 2 week trip to South Africa with Travel Department began with British Airways flights to Cape Town via Heathrow. From the day of arrival to day of departure our group of 26 were blessed by fair weather and moderate temperatures, with not a drop of rain. Arriving at Cape Town airport we were greeted by our guide Denise, a mature and very well spoken mature lady best described by one of our travellers as “The Countess”. We were led onto our plush leather-seated coach which had served as the South African Soccer Team bus during the 2010 World Cup. Immediately we were transported to the renowned Table Mountain, only to find that wind was too strong to permit the cable car to travel. Instead our driver, Malcom, brought us up Signal Hill, a lesser mountain, for a lovely view across the city and bays. We stopped for about two hours at the Victoria and Alfred Waterfront, an upmarket and very beautiful harbour-side leisure area characterised by a shopping centre, hotels, heliport and waterside facilities. One of our group chose a Malay curry for lunch, which was served in a frying pan! Cape Town proved to be a very beautiful city, among the loveliest I have seen, with both modern and historic buildings, and fairly free from graffiti and vandalism. In my opinion, it should be one of the loveliest cities on earth to live. The air is exceptionally clean and clear. The salubrious 4 star Winchester Mansions Hotel was our base for the first 3 nights. Located on the lovely grassy Seapoint promenade, it was interesting to watch the comings and goings of joggers, dog-walkers and children having fun by the sea. Being autumn the sun went down all of a sudden at 6pm, affording precious little time to enjoy the hotel’s beautiful location. Our first day’s excursion was to the Winelands, and we started by enjoying a 7 sample tasting at the beautiful Nederburg Estate, with historic buildings amid a vineyard on flatlands beneath sharply rising mountains in the distance. The samples, being South African, were standard measures as we know at home! A lovely al fresco buffet in the sun lunch interrupted our further five wine tasting at another vineyard! Following our wine-lands tour Malcolm drove us back to Table Mountain, where the winds had died down, allowing our ascent by cable-car to the 3000ft plateau overlooking Cape Town. Apart from the magnificent views of the city and beaches, the first thing I encountered were the hyraxes, delightful little furry animals about the size of a rabbit. Flying close by was the hyrax’s enemy, the Black Eagle. A black lizard scuppered along the rocks as I watched the hungry avian circle around in wait for dinner. 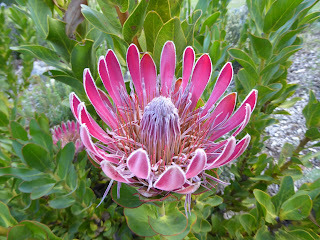 Our second day in Cape Town featured a splendid tour of the Cape Peninsula. Blue skies accompanied us for most of our holiday, adding great joy and light to our experience. Temperatures were generally a very comfortable average of 22C in the autumn of the southern hemisphere. The first small seaside we passed by was Bantry Bay, named after the very different bay in Ireland. A lot of South African places feature Irish place names:- Athlone is a suburb of Cape Town, Killarney is a suburb of Johannesburg, Belfast is a tiny town between Johannesburg and Kruger. 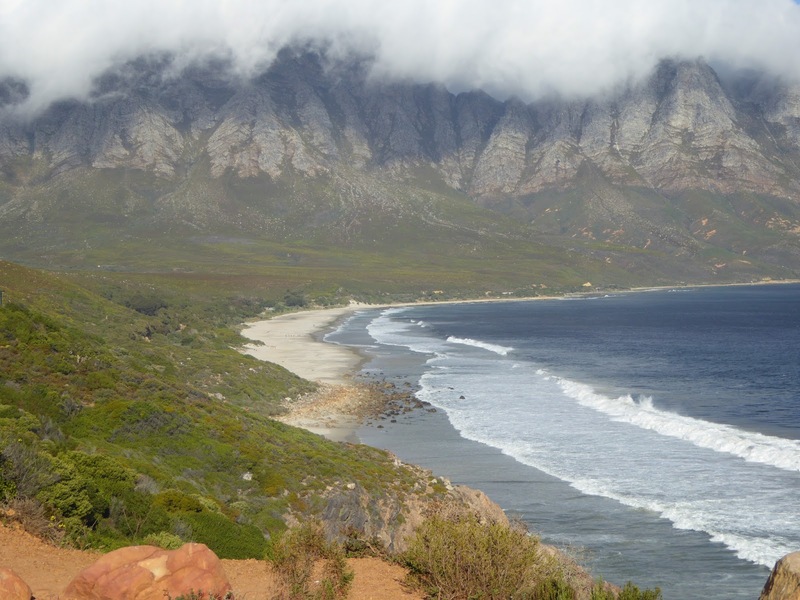 Further along the coast we passed by Camps Bay, a spectacular beach washed by Atlantic waves and backed by steeply rising mountains. We stopped at calm Houts Bay for a coffee and a strolls by souvenir stands. A spectacular road brought us onwards to Llandudno which bared a little, but little resemblance to its Welsh counterpart. We veered inland past some thatched cottages which would sit well along the west coast of Ireland, to the Cape of Good Hope, the most south-westerly point in Africa. It was a photographic “must-stop”. Retreating northwards we stopped for lunch at a lovely al-fresco fish restaurant where we sampled some lovely seafood, eating in the company of well-behaved, well cared-for cats, which were to be a theme of the South African trip. After lunch we stopped to see one of the colonies of African Penguins, with a lovely boardwalk over a sandy and rocky beach where the relatively small flightless birds thrive. Northwards our trip continued through Simonstown, a navy base where a statue to a famous Great Dane is located. This canine, the only dog to be officially enlisted in the Royal Navy, used to travel by train to Simonstown, making a “nuisance” of himself, so to be named “Just Nuisance”. With all this lovely scenery and seafood on board, it made for a good sleep which was to be followed by a visit to a more thought provoking place, and the start of our journey eastwards. A heavy sea mist set a sombre note on our visit to Robben Island. There is not much beauty about this little isle (apart from a pleasant little church in the small village) nor its infamous prison where Nelson Mandela spent so much of his life. The guides are all ex-prisoners themselves, and the one who guided my sub-group suffered from painful eye problems like Mandela, whom he had known well. Setting foot in the great man’s tiny cell, I pressed myself into a corner on top of a large doormat to try and help accommodate the other folk. The guide asked me politely would I mind stepping off Mandela’s bed! Returning to Cape Town by boat, we set off in the coach eastwards for a single night’s stay by the coast. Passing by Betty’s Bay and some dramatically scenic wave-lashed beaches with steep jagged mountains rising up beyond, we made a stop at the modestly proportioned Harold Porter Botanic Gardens. Sadly most of the native bushes or “fynbos” as they are called locally, were not in bloom but the magnificent national flower, the pink Protea, was. It was a peaceful garden in which to relax a while, and had a very nice bar/café with al fresco tables. 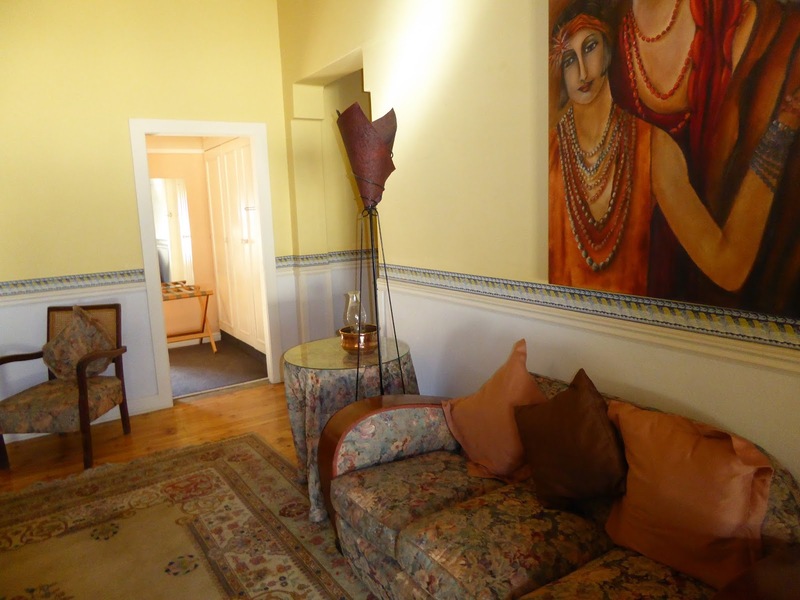 Denise warned us that the Windsor hotel in Hermanus might seem a little downbeat after our first hotel. In reality I actually preferred this simple 3 star hotel, which is located on a rocky seafront which has a reputation as a whale watching centre. Timelessly old-fashioned and simple, it reminded me a little of Benners’ Hotel in Tralee. As we arrived a piano was being beautifully played in residents’ lounge, which featured an enormous roaring log fire, surrounded by aged leather sofas. It was very homely and convivial. My bedroom was modern, bright and simple, with beautiful views from my terrace of the wild sea, and whale shaped chocolates awaiting me at the coffee making facilities. It was a nice late start in the morning, with a leisurely drive through pleasant Cape Dutch style villages and mountains. 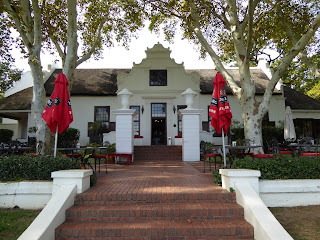 Arriving in the quaint town of Montagu, the first thing I noticed was a red bordered triangular road sign with the silhouette of a domestic cat in the centre. This was put in place years ago when a lady had just settled into town with her cats and the local authority obliged to make safe the favourite crossing area of the new feline residents! Our stop for the night was the utterly delightful Montagu Country House hotel, a little piece of the 1930s set in lush gardens full of patios and water features. Fluffy Coco-Cat was happily wandering the gardens and made her way into some of the ground floor rooms. All rooms in this hotel are different, and I was lucky enough to have an enormous, lavishly decorated one set on a corner overlooking one of the wee swimming pools. Later our group enjoyed a candle-lit dinner in the elegant dining room to the accompaniment of the piano playing of one of the hotel owners. I was sorry not to have seen more of Montagu, but we had to depart in the morning, stopping at Oudtshoorn for lunch, the ostrich capital of the world. We journeyed on through the Outeniqua Mountain pass to reach the Garden Route, the very lovely hill, Lakeland and wooded coastal area by the Indian Ocean. Our hotel for the next 2 nights was the most pleasant 3 star Knysna Hollows Country Estate, a modern establishment with bedrooms set in mainly thatched bungalows within the gardens around a couple of swimming pools. Charlie was the resident cat, a beautifully behaved feline with long honey coloured hair and a head like a miniature lion. He joined us at the table for evening meals, but did not beg for food, and accompanied us on walks back to our rooms in the grounds. I enjoyed a couple of swims in the pool nearest my lovely bungalow bedroom. Our day in the Knysna area started with a very pleasant cruise across the lagoon to the Featherbed Wildlife Park on the peninsula across the water from the town. A jeep took us up the hill to a point where we could walk downhill back to the open air roofed-restaurant where a terrific buffet was served, including an “ostrich shepherds’ pie”. There was not that much wildlife, but wonderful views over the narrow mouth of the lagoon which opened out unto the Indian Ocean. I did see a bushbuck which clambered from the walking path up through the shrubbery. Leaving Knysna our first stop was, not on the schedule, but by request of a majority of us to Knysna Elephant Sanctuary where, at a very small cost, we enjoyed close encounters and petting sessions with much cared-for formerly-abused elephants. Onwards we stopped as per schedule at the very beautiful wooded coastal Tsitsikamma National Park, where we were able to walk a boarded coastal path as far as the exit of the Storms River. Onwards we travelled to the historic industrial and fairly gritty town (with potential) of Port Elizabeth, where we stayed at the wooden chalet style Kelway Hotel overlooking a lovely beachside coastal resort area. Next morning we said goodbye to out lovely coach and driver Malcom at port Elizabeth Airport, where we departed for our next stop, Johanessburg, one and a half hours flight time. After landing in Johannesburg Airport we boarded a new bus driven by the multi-lingual Joseph who could switch in a second from his native African language to either English or Afrikaans, He drove us to Soweto, the huge township working-class suburb where the modern history of South Africa has its beginnings as the community, along with Nelson Mandela and his compatriots, wrought the changes from the apartheid system to a modern democracy. It is a gritty sprawling place, but full of welcoming people and waving children. We were shown the largest hospital in the world, the Baragwanath, which at first I had assumed was named after a native. Not so, the name is Welsh, from a settler. Passing by the house of Bishop Desmond Tutu, we stopped by a house formerly occupied by Nelson Mandela, to take a peek. After our tour of Soweto we stopped at a home restaurant run by a local lady and her family, who are pillars of the community and who do an awful lot of work to make everyone’s lives better. One of the famous power-cuts was in operation and the family unsuccessfully tried for hours to start a stubborn generator, but we enjoyed a most fabulous buffet home-cooked dinner by candlelight, which was followed by a Zulu dance performed by local children in traditional grass dress. Arriving fairly late at the ultra-modern and comfortable Sandton Park Inn Hotel, I made my way to my assigned bedroom only to find evidence of occupation, such as a finished bottle of wine. This was soon rectified with apology from reception. 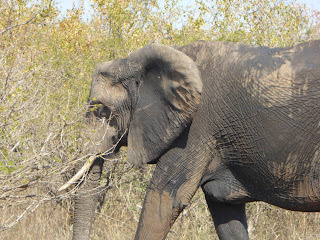 The next morning we faced a very early start for a 12 hour coach journey to the final destination of our trip, the Kruger National Park, renowned for the Big 5 wild animals, as well as many more fascinating smaller animals and birds. 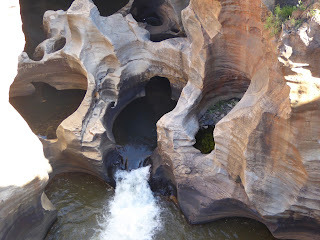 We stopped at three places of interest along the way, and it was these that took us a long way around to Kruger. The first was to Bourke’s Luck Potholes, a remarkable formation in the rock bed at the start of the Blyde River Canyon in the Drakensberg mountains. The second stop was at the edge of the canyon itself, which reminded me very much of the Blue Mountains in Australia with the wooded flat topped mountains. There was a bus-full of South African schoolchildren who all wanted to take plenty of photographs of the Irish people on their phones. Our final stop was at the Lisbon Falls, an impressive set of cascades. Our hotel for the next 3 nights, the Pestana Kruger, proved to be the only somewhat unsatisfactory hotel on the trip. In its favour the location was excellent, beside the entrance to the Kruger National Park, and the views from the terrace overlooking the Crocodile River are unsurpassed. The food was very good, the dining room and bar lovely. Staff were very pleasant, and there was a delightful pool in the beautiful parkland grounds. It fell down mainly in the bedrooms which are located in one and two storey buildings which are mostly quite some walk in the pitch black of the evening from the reception/bar/dining room. The rooms were ok but very ordinary for a four star hotel, but each guest found something lacking in the maintenance or housekeeping department. I fared well in merely lacking hand soap and tv reception. I improvised with shampoo. Others had major plumbing problems, floods, electrical failures. The rooms were quite noisy at night with the activities of the monkeys in the surrounding trees! We were booked on 2 safari trips over 2 days. The first trip was for a half day, with leisure time by the lovely hotel pool in the afternoon, and the second was a full day game viewing. Both trips started at 6 in the morning, and we entered Kruger just in time for the beautiful sunrise. Our group was divided among 3 open-top 4WD safari vehicles which afforded both protection from danger and great views of the animals and birds. The first animals we encountered in Kruger were the deer-like bushbuck and kudu, which are the most numerous creatures in the park. But soon afterwards we had a very fortunate sighting of a rare black rhino, which was very close to our vehicle, albeit amid the bushes. I closed my eyes when I heard that a dead baby monkey had been spotted, freshly killed by a speeding car. Later I heard that the guide in another of our vehicles had spotted the incident happening and reported the driver to the authorities. The driver in question denied knowledge of having hit the baby monkey who was following his mother across the road. Another sad sight was a lone lioness, who was very close to the road, and obviously with not much life left in her. She was walking around slowly, so malnourished her ribs were clearly visible, as was a semi-healed great hole in her side. Not long after that we saw a plethora of vultures wheeling around, where obviously a corpse lay in the vicinity. It may have been the baby monkey, but could have been the remains of any recent kill. But the remainder of the game sightings were absolutely thrilling. Lots of zebras, a close-up cheetah, a leopard hiding in bushes, distant lions, lots of elephants and white rhinos, 2 chameleons crossing the road, warthogs, various eagles, hornbills, guinea fowls, crocodiles, bright blue starlings, giraffes, tree squirrels, wild dogs, buffalo, an abundance of kudu, bushbucks, impalas, a tiny steenbok; and blue wildebeest – not quite the “herds of” mentioned by a certain Basil Fawtly to the deaf lady who booked into the infamous hotel in Torquay. I had to put out my hand to stop the traffic when the second chameleon slowly crossed the road, and the driver/guide of one of our convoy wondered at why I cried halt until he looked down and saw the tiny thing changing colour in front of ours eyes. The coach direct to Johannesburg Airport took a mere 5 hours or so, compared with the ponderous lengthy outward journey. We broke our journey firstly at an upmarket old-fashioned country food store with several adjoining outlets for food and refreshments, and for lunch we stopped at an extremely well-run motorway service centre with several quality fast-food outlets-you could call it the Rolls Royce of McDonalds! The flight back to Heathrow was aboard an A380, the largest passenger aircraft in the world. Boarding this 500+ seater aircraft was most orderly and accomplished faster than it took to rush on board a Ryanair before they allocated seats. It was my first time on this twin deck aircraft, but alas it was just like any other wide-body with a cramped up layout. The only difference at all I noticed was that the engines made a muffled deep “boom” sound as they started up. We got off right on time and arrived to Heathrow 10 minutes early. I didn’t even have to change terminals as my flight back to Dublin took off from Terminal 5, arriving back about 8am in Dublin, with the day ahead of me to do the tedious unpacking and washing!